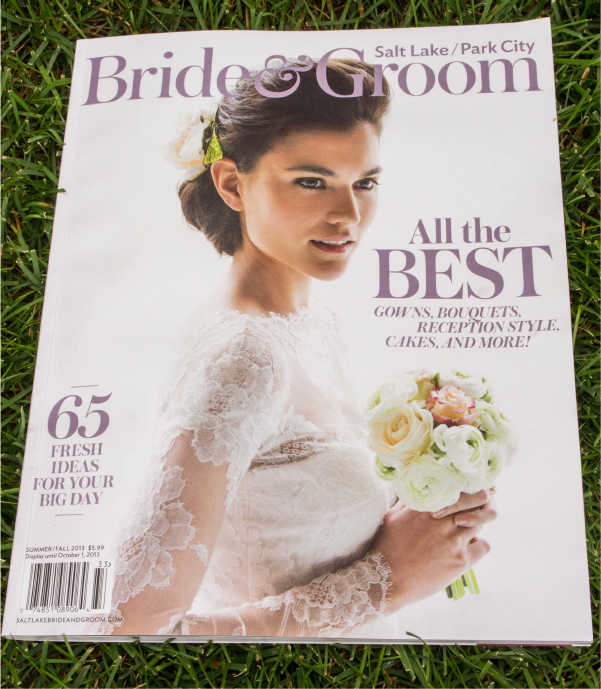 Salt Lake/Park City Bride & Groom Summer/Fall Issue! We are honored to be featured in the new Salt Lake/Park City Bride and Groom Summer/Fall 2013 magazine. Our ad on page 12 features Tommi Ellingford-Wardle's letterpress invitation. Tommi was one of our favorite brides from 2012 and we love her invitation representing us for 2013. We we also thrilled to have Tommi's matching save the date card and envelope featured by Salt Lake/Park City Bride and Groom in their "Western Union" feature on page 28. There are some gorgeous invitations featured in this section that you should really check out. Other big news from this issue is the reveal of Michelle Leo Events and her exquisite new look on page 41. She was also the wedding planner and designer for Devan Guilford and Rodrigo Vidal who are featured in real weddings on page 42. Her award-winning wedding design and event planning services have won her the prestigious Best of State award three years in a row. We had a hand in producing her new business cards so we're particularly excited about her glam new look. If you haven’t seen her new business cards you should definitely pick one up from her today. As always, Culinary Crafts 2 page ad spread is a centerpiece of the magazine and if you're not already familiar with Culinary Crafts they are a centerpiece of the Wedding industry in Utah. Check out more of their amazing work in real weddings where they are featured for catering Tauri Stevens and Dylan Tucker page 38, Devan Guilford and Rodrigo Vidal page 42 and Candice Yee and Eric Bender page 46. Another favorite vendor of ours is Julie Hill, owner of Layers Cakes. If you are looking for a beautiful cake that is handcrafted by a talented woman you've got to make a point of meeting with Julie. Julie is incredible to work with. On several occasions we have worked with a mutual client and Julie has an incredible skill of taking the look that Ann Elizabeth has developed for the client's party and translating it to the cake in a truly inspired way. For some of her gorgeous work check out the "Romancing the Stone" feature on page 79 where she made a three-tier fondant and rock candy cake. Layers Cake also did a fondant cake with bamboo accents for Candice Yee and Eric Bender who were also featured in real weddings on page 47. I love Mayflowers Floral & Event Design. Their touch that brings a romantic yet refined look to any arrangement of flowers is work of art. Their flowers are featured in Devan Guilford and Rodrigo Vida real weddings on page 42. We are also proud to have featured Mayflowers this month in our Bride of the Month feature for Chandler Huntsman-Astin. I also need to give a shout out to Rebekah Westover for her amazing photography and attention to detail that was featured in real weddings for Paige Stoner and Joshua Garcia page 50. You can see more of her work as she to was featured in our Bride of the Month for her photography for Chandler Huntsman-Astin. And finally, can we talk about the cover of this issue please!? I love the stylistic choices made for this issue's cover photo. The soft, swept away from the face hair really accents the natural beauty of the model's face. I also love the very neutral makeup and basically bare lips and nails. This romantic styling of the bride's hair and makeup couldn't be a better fit with the sleeved dress and petite bouquet. Once again a huge kudo's to the talented people who brought the cover to life.